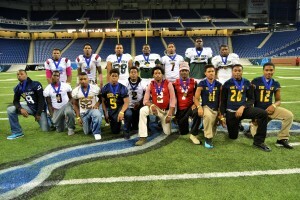 Last weekend’s Michigan State-Michigan football game looked like a “Who’s Who in Detroit Public School League recent history” as former PSL standouts were everywhere for the Spartans and Wolverines. MSU’s Tony Lippett (Crockett) — the best receiver on the field; Lawrence Thomas (Renaissance) and Ed Davis (Southeastern) — impact players for the Spartans’ top-ranked defense; Dennis Norfleet (King) — U-M’s main running threat; Cass Tech’s Jourdan Lewis, Delano Hill and Royce Jenkins-Stone — played major minutes for the Wolverines’ defense. 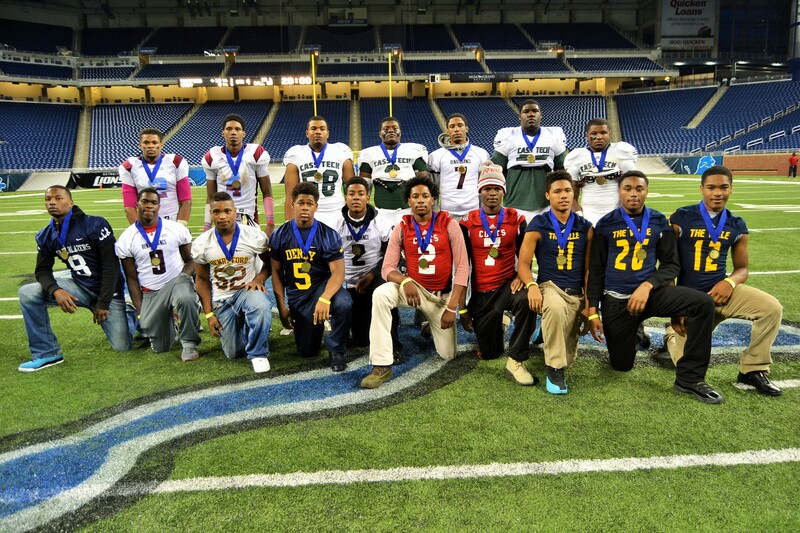 Each year, the PSL produces some of the nation’s top college prospects — and the 2014 PSL All-City football team continues that tradition! DCP-Northwestern — athlete John Dozier, quarterback Danny Whitt Jr.
Pershing – running back-strong safety Nyassinu Crowell Jr.
Weber, a 5-10, 205-pound senior, is a U.S. Army All-American and is verbally committed to Michigan. He’s one of the fastest and strongest running backs in Cass Tech history and showed out in the PSL championship game at Ford Field with 11 carries for 178 yards. That pushed him past the 1,000-yard rushing mark for the third consecutive season. He scored three touchdowns, including a 76-yard TD on a screen pass. He has scored 19 TDs on the year. Alabi, who is verbally committed to Ohio State, is the main force paving the way for the Technicians’ running game. The 6-5, 275-pound senior is noted for his discipline and blocking until the whistle blows. Oliver, a 5-11, 220-pound senior, was a mainstay for the Cass Tech defense. A student of the game, he had 89 tackles, two fumble recoveries and two sacks. Thompson, a 6-1, 220-pound senior, is ranked the state’s top class of 2015 linebacker and is one of just three repeat PSL All-City players from last year. He will graduate in January and enroll early at Michigan State. A two-year team captain for King, Thompson has been chosen to play in the Semper Fidelis All-American Game on Jan. 4, 2015, in Carson, Calif. He owns a 4.4 grade point average. Stallworth, who transferred from South Lake High to King, is also verbally committed to Michigan State. The 6-4, 265-pound senior is ranked among the state’s top offensive linemen and anchors the front on both sides of the ball for the Crusaders. Corley, a transfer from Wyandotte Roosevelt, emerged this season as one of the PSL’s top talents. The 6-2, 165-pound junior has received multiple Division 1 college offers, including Michigan, Michigan State, Mississippi State, LSU, Wisconsin, Notre Dame, Iowa, Illinois, Maryland, Wake Forest, Pitt, Arizona State, among others. He’s being recruited as a sure-handed wide receiver and has been equally adept as a standout defensive back for the Crusaders. Washington, a 6-4, 180-pound junior, has made a big impact in his first season at King after moving to Detroit from San Diego. A pro-style quarterback, Washington pulls the trigger for a pass-reliant Crusaders’ offense and is drawing a lot of major college interest. March, a 6-3, 210-pound senior, is a three-year starter at tight end and defensive end and has college offers from Bowling Green, Southern Illinois, Toledo, Eastern Michigan, Ball State and Morgan State. He entered the Bulldogs’ last game of the regular season with 89 tackles, including 16 sacks and 29 tackles for loss. Mitchell, a 5-9, 170-pound junior, had 33 catches for 477 yards and six touchdowns through eight games. Posey, a 6-0, 200-pound junior, was a dual threat QB, completing 19 of 33 passes for 277 yards and three TDs while rushing 16 times for 177 yards and four touchdowns. As a linebacker, he had 77 tackles, including nine for losses. Lewis, a 5-11, 185-pound senior, led Renaissance’s offense. He had 86 carries for 529 rushing yards and threw for 825 yards and 11 touchdowns. McCants, a 5-11, 190-pound senior, is a repeat All-City selection. He had 70 tackles with one sack and 13 tackles for loss. Wilson, a 6-0, 185-pound junior, had 41 tackles, four for loss, and one interception. Offensively, he had 19 catches for 502 yards and nine TDs. Ball, a 5-9, 175-pound junior, led Cody’s offense with 114 carries for 1,029 yards and nine touchdowns. Taylor, a 6-5, 387-pound senior, was the Comets’ top lineman on both sides of the ball. His agility and speed defies his huge physical presence. Davis, a 6-2, 185-pound senior, had 25 catches for 384 yards and six touchdowns for the Mustangs. Defensively, he had 30 tackles, six pass deflections and one interception return for a TD. Jones, a 6-0, 200-pound senior, had a team-leading 56 tackles, 10 tackles for loss, three sacks, two interceptions and one interception return for a touchdown. Whitehead, a 6-1, 185-pound senior, had 45 catches for 754 yards and 10 touchdowns for Denby’s offense. He led the defense with five interceptions, two returned for touchdowns, and returned two kicks for TDs and one punt for a score. Calhoun, a 5-9, 205-pound sophomore, ran 120 times for 1,247 yards and seven touchdowns and had 20 catches for 212 yards. Defensively for the Tars, he had 45 tackles, including five tackles for loss and three sacks. Dozier, a 6-1, 180-pound senior, had 41 pass receptions for 675 yards and eight touchdowns. He also was an impact defender for DCP-Northwestern with 57 tackles, six interceptions and one TD. Whitt, a 6-0, 160-pound junior, completed 90 of 169 pass attempts for 1,254 yards and 13 TDs. He ran 22 times for 215 yards and three TDs. Moore, a 6-3, 212-pound senior, is a four-year starter for Central. He had 18 catches for 596 yards and six touchdowns as a wide receiver. On defense, he had 49 tackles, seven forced fumbles, three fumble recoveries, 11 sacks and one interception returned for a touchdown. Ross, a 5-10, 190-pound senior, was chosen to his fourth consecutive PSL All-City team. The Central Michigan-verbal commit had 164 carries for 1,310 yards and 17 touchdowns and two receiving TDs entering Western’s final regular season game. He also returned a kick for touchdown and had three pass interceptions, one returned for a TD. Crowell, one of the two sophomores on this year’s All-City team, rushed for 1,300 yards and averaged eight tackles a game for the Doughboys. Bonner, a 6-2, 180-pound senior, had 600 yards and eight touchdowns receiving and 250 yards rushing. He’s described as “the heart” of Osborn’s team. Wilson-Jackson, a 5-8, 225-pound senior and two-year team captain, had 63 tackles, 28 for lost yardage, 33 solos and 16 QB sacks. He forced four fumbles and recovered two. The Trojans ran 80 percent of their offense behind him. Moore, a 5-10, 167-pound senior, was in on 74 tackles with two sacks and four interceptions. Offensively, he caught five passes for 112 yards and one touchdown. The Hurricane player is a student at Benjamin Carson Academy. Smith, a 5-10, 180-pound senior, rushed for 350 yards and recorded 69 tackles for CMA’s first-year varsity team. Amos, a 5-10, 165-pound senior, ran for four touchdowns, threw for another and, defensively, had two interceptions. This entry was posted in Boys, News and Press Releases, Sports.